"I should like," he said, raising his glass, "to propose a toast to someone whom, though I have known her for only a few days, I consider to be one of the best friends I've ever had. To Trixie!" Everyone drank and cheered while Trixie tried to hold back the tears of happiness she felt welling up in her eyes. Then Mr Carver reached in his pocket and drew something out. "And," he continued, "as a remembrance of your trip to Rosewood Hall, I want you to have this." He handed her the gold locket. As Trixie slowly opened the little heart and looked once again at the picture of Ruth and her husband, Mr Carver said, "I'm sure you'll have a picture to put in the space where the secret message was." Before she thought what she was doing, Trixie raised her head and looked down the table at Jim. No one had to guess whose picture she would choose. 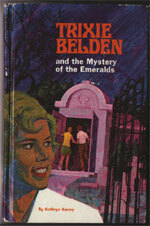 The ghostwriter of this book is assumed to be Virginia McDonnell. 7. "Get Out of Here!" 8. "Welcome to Green Trees!" Sleepyside, New York and Williamsburg, Virginia. 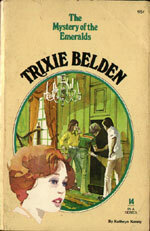 Trixie finds an old letter in a secret space in Crabapple Farm and she and Honey set out to find the intended recipient of the letter. Their search leads the Bob-Whites to Williamsburg, Virginia to find Rosewood Hall and the cursed Emeralds, hidden before the civil war. 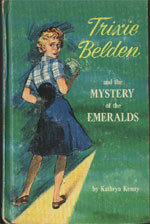 Miss Julie Sunderland - the ninety year old niece of the letter's author. It is thought that Virginia McDonnell wrote this book and The Mystery of Cobbett's Island. The plots are certainly similar, both mysteries starting with Trixie finding a letter and they have to follow instructions to find a treasure. In both books, the young villain doesn't turn out to be so bad and is able to be reformed. Neil is thought to be a villain at first, especially after he follows them and attacks Jim but he redeems himself. The real villain is Jenkins, who causes Mr Carver's accident and tries to sell him a fake emerald necklace. He also beats his horses and he seems a similar sort of man to Jim's step-father, Jonesy. Trixie wakes up yelling "Rabbit, Rabbit" to make a wish come true at the beginning of the month. You could assume it is July seeing the book takes place after their June trip to Cobbett's Island, but strangely the 4th of July gets no mention. Di is described as having violet eyes (p. 18) and the trip is said to be for her coming birthday. There is a birthday cake and singing at the end of the book, but it is not said to be Di's birthday. Jim's birthday is also in July, but this is not mentioned. Dan gets mentioned early in the book, but does not make an appearance and misses out on his fourth Bob-White vacation. Jim has a pet catbird, named Cheerio (p. 65). 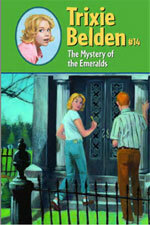 Trixie, who didn't know a fake diamond from a real one, can now tell a fake emerald from a real emerald! Even Di and Honey were not as certain as she was that they were fake (p. 92). Mr and Mrs Lynch are not named in this book and Mr Lynch refers to his wife as "Mother". There is no mention of their two sets of twins anywhere in the book or any phone calls home by them or Di, to their other children. The girls got ready for the party and "light lipstick made them look unusually pretty" (p. 231).